Researchers at Sheffield Hallam University have developed a system that uses VR to teach amputees how to use new prosthetic limbs. Ivan Phelan, games developer and lead VR researcher, wants to help both people who have lost a limb and those who have never had one. 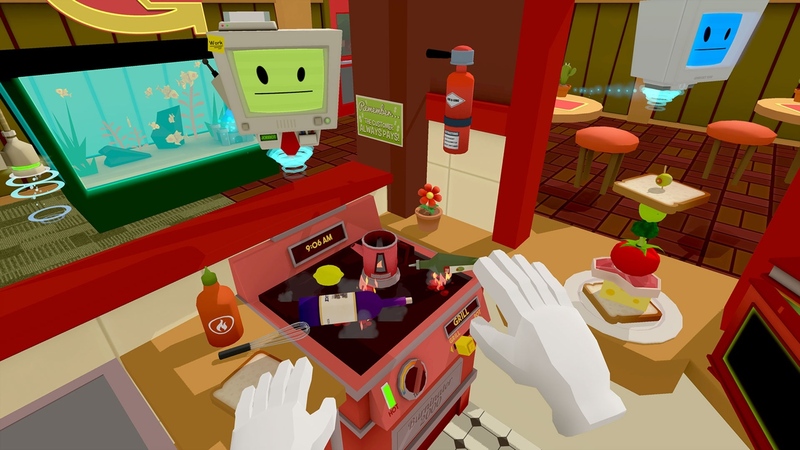 The app used in the training looks a bit like Job Simulator (pictured) in its floating hand controls, but with more realistic visuals. The participant wears a HTC Vive headset, holds a regular Vive controller in one hand and has a Myo gesture control armband, which reads EMG signals, on the amputated arm. Then they practice opening and closing the Myo-controlled arm and picking up and putting down objects, all in animated, virtual reality. We've seen demos of the Myo armband being used to control existing prosthetic limbs before, but this technique means that it will be easier to test for the reflexes needed to make a prosthetic work too. Previous versions of the university's experiments in VR used an Oculus Rift. VR could also help with phantom limb pain, replacing the old fashioned technique of using a mirror to show amputees what their missing limb would look like in that position. UCL and Middlesex University are using an Oculus Rift to get participants using their prosthetics, to open and close hands for instance, in virtual reality. It's designed to help the brain embody or accept the new limb and reduce pain. It's not just prosthetics researchers who are making the most of these new, high end, relatively affordable headsets. VR apps and experiences are being developed to help people visualise and try out everything from getting over phobias such as fear of heights or claustrophobia to virtual therapies for patients struggling with mental health problems.